During the course of the performances, a physical workshop with Dominiki Efstratiou will be offered. Click HERE for more info. Conceptualized by Korina Kontaxaki, and developed through a series of physical workshops with internationally acclaimed choreographer and movement instructor, Dominiki Efstratiou, this insightful solo piece takes us back to the beginning; the beginning of man’s most significant relationship. His relationship with the earth. "I am troubled by the materialistic, throw-away world we live in. Frequently, I question what the archaeologists of the future will recover from our age? Broken furniture from Ikea, and other types of rubbish, no doubt. In that sense, I was immediately struck by the opening of the performance. A consumer, converted into a moron, the victim of bread, circuses and advertising. Can man ever be different? The representation of the victim’s return to a natural state, albeit with the peace that came with it (at least to begin with), worked well. Of course, her communion (and socialisation) with nature brought her into competition with others endeavouring, just as plainly, to survive also. Returning to society, as if having just woken from a dream, this time reflected in the guise of the nonsensical politician, in a sense conveyed the hopelessness of our condition: governed by our reliance upon nature (whether the fruit from a tree or a human). Survival engenders competition, chaos and frustration, and The Plastic Age conveyed this in ways I could not have predicted. The soundtrack was intelligent, disturbing, with humorous touches (at important junctures) to lighten the mood. I congratulate you! 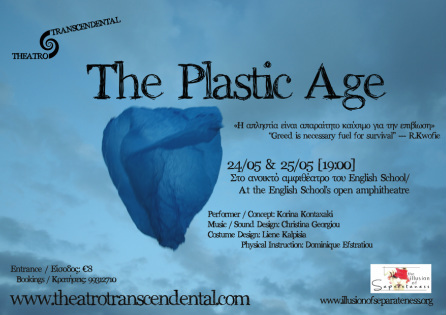 Well done to all at Theatro Transcendental for a highly successful work."